ALDERICUS (ALDRIC, AUDRI), after receiving monastic tonsure at the Abbey of SS. Peter and Paul of Ferrières (l'abbaye Saint-Pierre-et-Saint-Paul de Ferrières), in the Centre-Val de Loire region of present-day north-central France, St. Aldericus served as a priest in the Archdiocese of Sens. He later served as Chancellor of the Archdiocese of Sens before being consecrated its Archbishop in 828. St. Aldericus reposed in 841. CASSIUS and FLORENTIUS, (Late Third Century), according to tradition SS. Cassius and Florentius were members of the Theban Legion (22nd September) who were beheaded at Bonn for the faith. The Bonn Minster, originally the collegiate church of SS. Cassius and Florentius, is situated at the spot where they are believed to have been martyred. SS. Cassius and Florentius are the patron saints of Bonn. CERBONIUS of Verona, venerated as a Bishop of Verona who reposed circa 400, nothing certain is known of his life. CERBONIUS, a priest from North Africa who, like most of his fellow Christians, fled the Arian Vandals, settling in Populonia in Tuscany. Known for his holiness of life, St. Cerbonius was chosen to serve as Bishop of Populonia circa 544. He later was exiled to Elba for having hidden Roman soldiers from the invading Ostrogoths. St. Cerbonius spent the rest of his life as a hermit on Elba, reposing in 575. He was buried at Populonia, however his relics were later translated to Massa Marittima in southern Tuscany and enshrined in the Cathedral of Saint Cerbonius. CLARUS, (Third Century), a missionary to Brittany, who served as the first Bishop of Nantes. According to some traditions, St. Clarus was a disciple of the Apostle Peter (29th June). FULK, the twenty-first Abbot of Fontenelle (Abbey of St. Wandrille) in Normandy. He reposed in 845. GEREON, (Late Third Century), believed to have been an officer in the Theban Legion (22nd September), and member of the same detachment as SS. Cassius and Florentius (vide supra), martyred in or near Cologne. St. Gereon's Basilica in Cologne commemorates him. PATRICIAN, (Fifth Century), a bishop of an unknown See in Scotland. Forced to flee his See by heathen invaders, St. Patrician spent the rest of his life in exile on the Isle of Man. Nothing further is known of his life. PAULINUS of CAPUA, a pilgrim, most likely British, who, while staying in Capua (near Naples), was selected to be their bishop by the local population, albeit against his will. Acquiescing, St. Paulinus served that See as a model prelate for eight years, reposing in 843. PAULINUS of YORK, a native of Rome, St. Paulinus, along with SS. Mellitus (24th April) and Justus (10th November), was sent England by Pope St. Gregory the Dialogist (3rd September) to reinforce St. Augustine’s (27th May) mission. St. Bede the Venerable (25th May) writes in his Historia ecclesiastica , that when St. Ethelburga of Kent (8th September), married King St. Edwin of Northumbria (12th October), St. Paulinus was consecrated the first Bishop of York, and accompanied St. Ethelburga to her new home. Once in Northumbria, St. Paulinus, with the assistance of St. Ethelburga, converted King St. Edwin and was instrumental in the conversion of Northumbria. Following King St. Edwin’s martyrdom in 633, St. Ethelburga returned to Kent accompanied by St. Paulinus, who was then made Bishop of Rochester, serving that See until his repose in 644. TANCA, a maiden from Troyes in north-central Gaul, who was martyred defending her virginity circa 637. 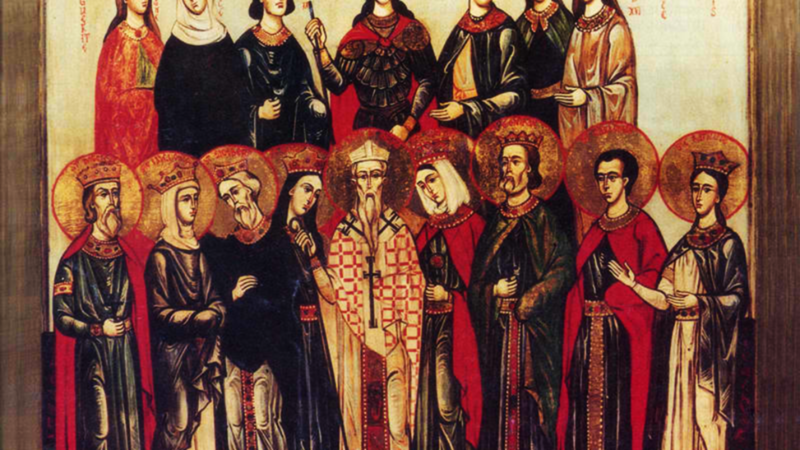 VICTOR and COMPANIONS, (Late Third Century), a group of three hundred and thirty soldiers of the Theban Legion (22nd September) who were martyred at Agaunum (present-day Saint-Maurice, Switzerland). No further information is extant.